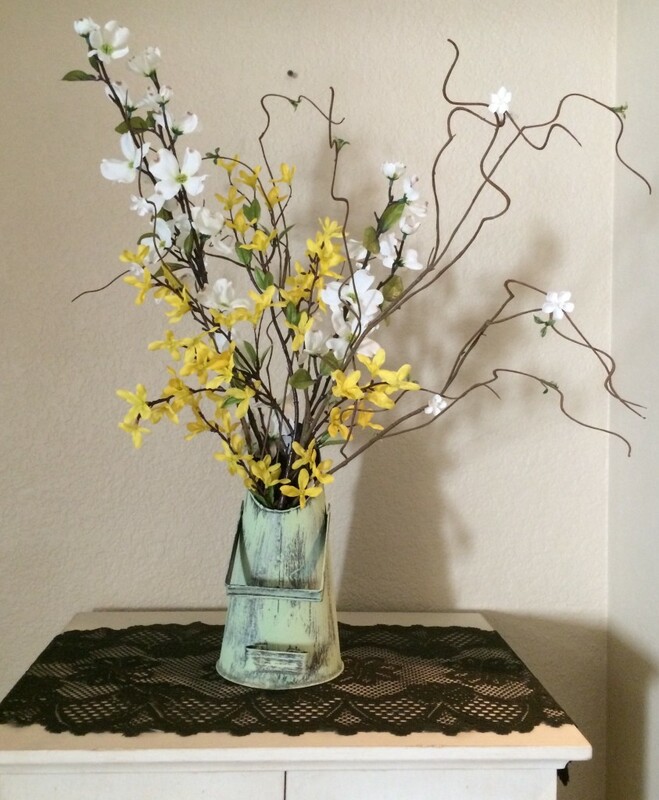 This yard sale find turned spring vase is something that I picked up at a yard sale quit a while back. Not sure what it was used for, I just thought that it was neat looking. I think it may be made of brass and just be badly tarnished, so I decided to give it some color and use it as a vase. 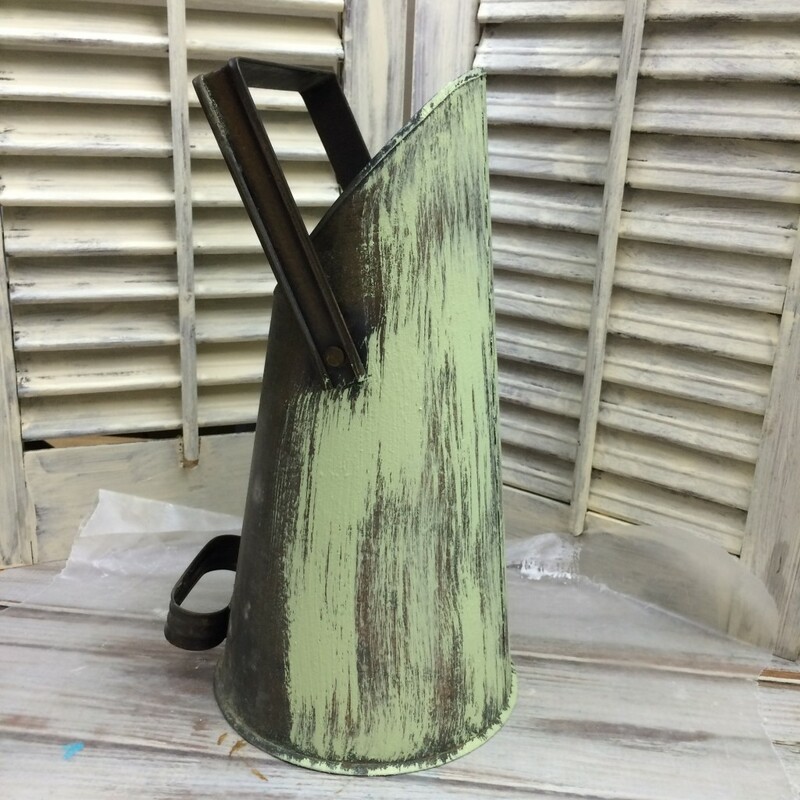 Using Ceramcoat Green Tea (affiliate) acrylics and baking soda (homemade chalk paint) I add some color by dry brushing some paint on my yard sale find letting some of the tarnished color show through. 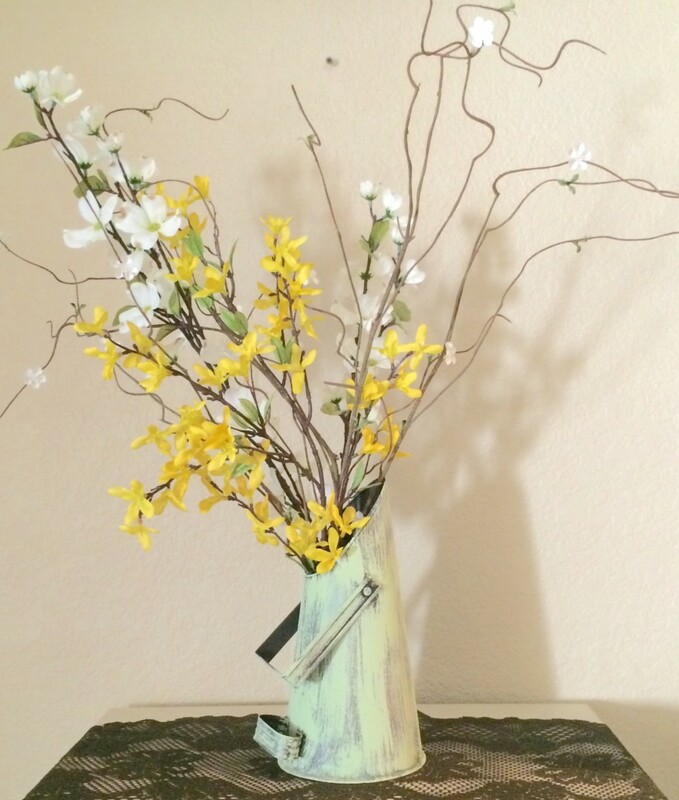 Once dried I added some spring flowers to my new spring vase. You may remember seeing it with my Diy Easter egg jar. I was going to paint it a darker more turquoise color, but I’m glad I chose this color instead. I like how it turned out. 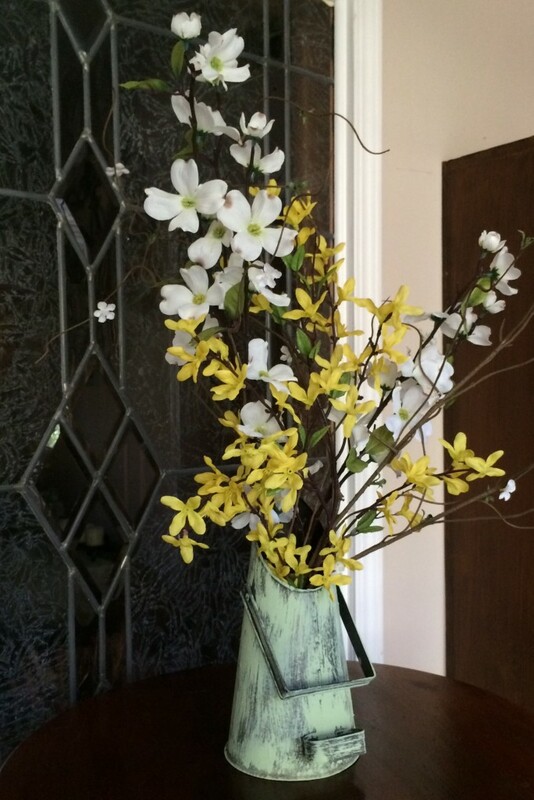 Do you know what my new spring vase was called, and what it was used for? Thank you Cathy! I am very happy with how it turned out and love the color. Thanks for stopping by! I have no idea what it is called and what can be used for, but it is really nice! I love the color you chose too, it reminds me of a light patina. The yellow and white flowers fit perfectly, really pretty! Enjoy the rest of the week, Linda! Thank you Pili! I really like the color too. I was going to go with a darker turquoise color but glad I chose this color. Thanks for the invite, I am taking a week or two off to try and catch up on things, then I will be back to join a few linky’s. Thank you LZ! I do have to say it does look pretty with the spring flowers. Thank you for stopping by! I love this! I would have probably walked straight past this – you certainly have a good eye for seeing potential. Thanks Sam! I have a thing for pitchers, jars, bottles so when I spotted it I had to have it. Linda I love this, It is so rustic and farmhousey. I don’t care what it is I just like the unusual shape and how nice it looks with your flowers. Thank you Mary! I think that’s why I picked it up because it was unusual. 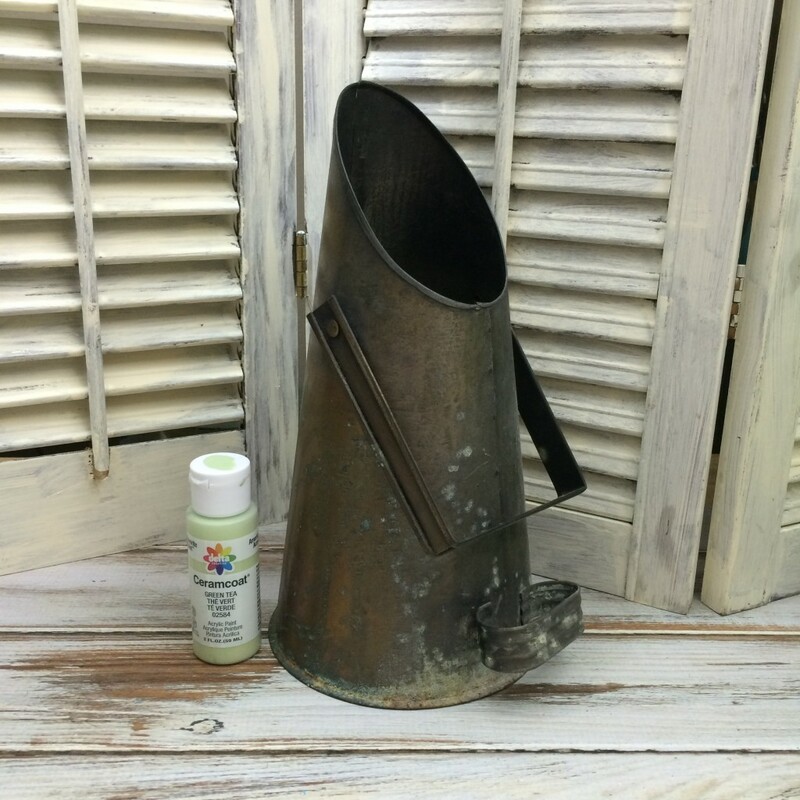 Hi Linda – It’s an ash bucket to clean out the fireplace/stove. Notice the handle on the back near the bottom? Thats to use to shovel the bucket into the ash pile. But I think I like it better as a vase!! Very nice the way you painted the lighter colour and used the sping flowers! Cool! Thanks Heather, I was wondering what it was. I had thought of that but then dismissed that because it isn’t very big. But glad to finally know for sure. I like it better as a vase too. That is a really good use of the yard sale item. I love doing projects that recycle other things too. Thanks Carol! I do too. 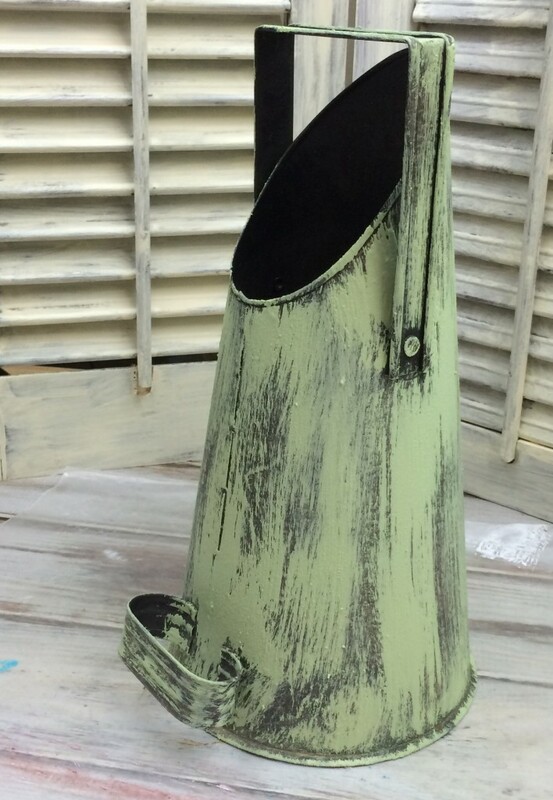 You can find some great stuff at yard sales and turn them into something even better. Thank you Renee! I thought that it was a pretty cool looking metal pitcher. Wish I knew what it was used for. Linda, I really love the shape of this container, and although I didn’t know what it was for, I would have scooped it up too. At least I hope I would have, it’s lovely. I see above that it’s an ash bucket, that’s really cool. And it’s in such good shape. 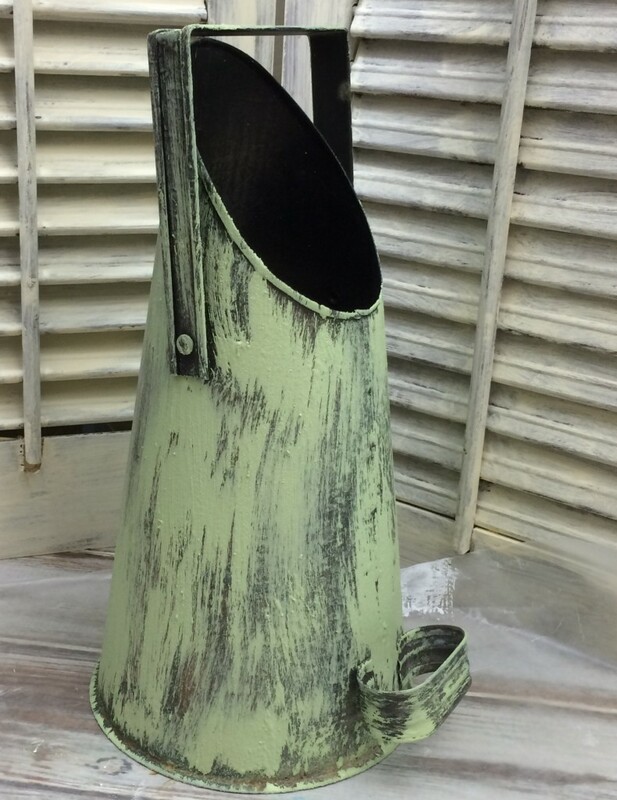 The color you chose is perfect, the brass underneath shows through well, and this looks like it was made to be accented with the green! The flowers and branches look so nice in it, it’s a striking piece! It’s funny that I had to have the little bucket when I seen it but hadn’t a clue what I was going to do with it. It was stuck in the closet I’m sure for a couple years. Then one day I guess it spoke to me and said get me out of here, LOL. It was perfect for some spring decor. I guess It just took me so long because I just didn’t think that I should paint it.